Apex Court Reporting (877)871-2654 » CART Realtime Translation for the Deaf & Hearing impaired. CART Realtime Translation for the Deaf & Hearing impaired. Nationwide CART Services for the Deaf & Hearing Impaired. CART for the classroom helps students that are deaf or hearing impaired have access to communication. 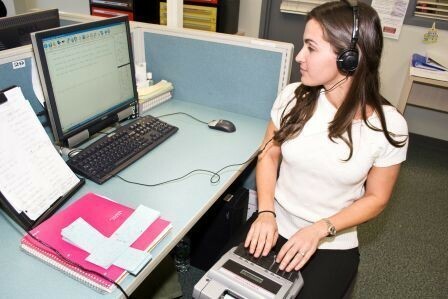 Communication Access Realtime Translation (CART), or captioning as it’s also known, is a process whereby a CART provider or stenographer, using a steno machine, notebook computer and realtime software, provides instant word-for-word speech-to-text translation for display. In order to furnish a highly readable English translation, our CART providers (stenographers) possess shorthand speeds of well over 225 words per minute, with a general accuracy level of 99% or greater and are fully educated on the Deaf, deafened and hard of hearing culture. For those with a hearing loss, the difference between a good captioner and a poor one can translate into either a full understanding of events or an exceedingly confusing experience. Our CARTers (stenographers) are dedicated to total communication access for this significant segment of our population. We offer high-quality captioning services using reader-friendly fonts and formats. We include extra explanatory notes to communicate subtleties, nuances and other conversational details that support full comprehension. Advanced technology and equipment enable us to provide CART services in almost any setting. Following an event, captioned proceedings may be made available in electronic format. Our CART professionals are trained to convey the total experience, including such things as gestures, laughter and surrounding sounds in the captioning. This is crucial for the hearing loss community, particularly in crowded or fast-paced speaking environments such as annual general meetings, hearings or informal settings with multiple participants. A Remote CART provider can translate the spoken word into text in real-time from a remote location. Remote CART is a service in which we deliver communication access anywhere the recipient has Internet and telephone connections. The audio feed* lets the captioner hear the meeting taking place. The spoken word is then transcribed into English and sent to the consumer(s) for viewing, within seconds of the words being spoken. For larger groups, the receiving computer can be connected to an LCD projector. We can obtain an audio feed in two methods – one via Skype and the other via speaker phone. *Note: For optimum results in remote captioning, the audio feed to captioner must be of excellent quality. Our company provides on-site CART services nationwide as well as remote CART. Call us at (877)871-2654 or Contact Us to schedule your event, courthouse or educational CART services.